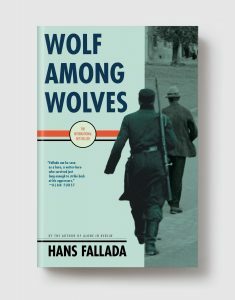 Wolf Among Wolves is a sprawling saga of the collapse of a culture—its economy and government—and the common man’s struggle to survive it all. Set in Weimar Germany soon after Germany’s catastrophic loss of World War I, the story follows a young gambler who loses all in Berlin, then flees the chaotic city, where worthless money and shortages are causing pandemonium. Once in the countryside, however, he finds a defeated German army that has deamped there to foment insurrection. Somehow, amidst it all, he finds romance—it’s The Year of Living Dangerously in a European setting.